Papua New Guinea has probably the best diving of any location in the World. A lot of it is relatively untouched, even the sites that are more popular with operators. 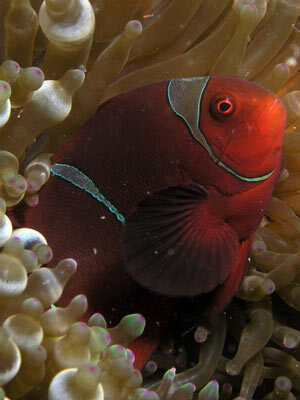 I have now dived six locations in Papua New Guinea and each one of these locations has sites that are simply amazing. Even the sites that are not the best ones at the location are sites that elsewhere in the World would be rated as a top site. 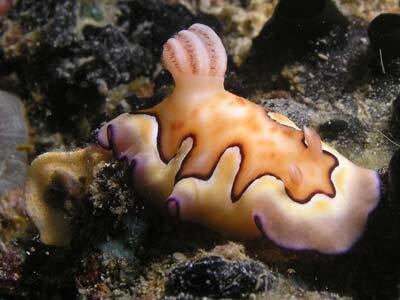 The New Britain Provence of PNG has some great diving. Places like Walindi Resort at Kimbe at the southern end of the island is the best known, but the Rabaul/Kabaira area at the northern end of the island has some fantastic diving. 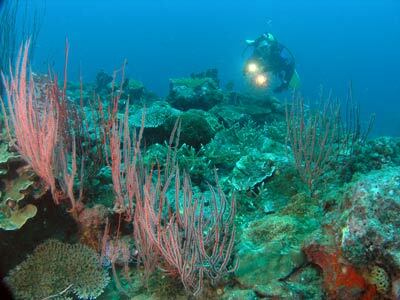 One of the sites that is done as a second dive is Sin Reef. This is located on the northern shore of Ataliklikum Bay about 2.04 kilometres from Kabaira Resort. It is only a five minute run from the resort. The GPS location is S4º 14' 14.2" E152º 00' 09.1º using WGS84 as a datum. 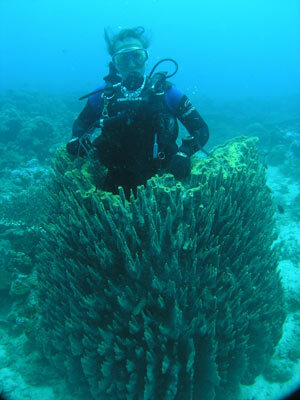 The reef is about eight to nine metres deep on the top. This reef is sort of shaped a bit like a figure 8, with it facing north-east. The middle and top section of the 8 are a sort of saddle, lower than the O bits. On the north-eastern end it actually connects to more reef (perhaps the main fringing reef) after a small deeper section. The south-western side slopes to a sandy bottom at about 15 metres. The southern and south-eastern sides are deeper, a little over 35 metres. The northern side is about 10 metres deep. This dive normal starts at the north-eastern end of the reef. You should head to the south-east and this will take you to the deepest section of the reef. 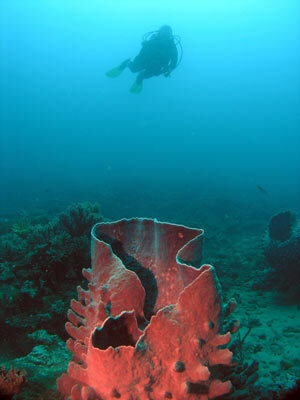 Along this section there are gorgonias, sea whips, large barrel sponges, other colourful sponges and anemones. The anemones have clownfish and clear shrimp. I also saw a turtle in this area. Near the middle of the 8 there is the biggest barrel sponge I have ever seen. It is so big a diver can get inside it with gear on without even touching the sides. Have a look at the attached photograph. Around this area the bottom has some large coral bommies. As you head south-west there are some smaller bommies. The reef turns to the right (west) and then north. The depth comes up gradually as you go. There is a lot of really interesting stuff along here and well worth doing the full circumnavigation. 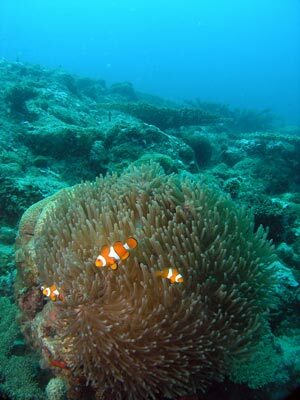 Further along there are some anemones with "Nemo" clownfish. You are now back near the anchoring point. 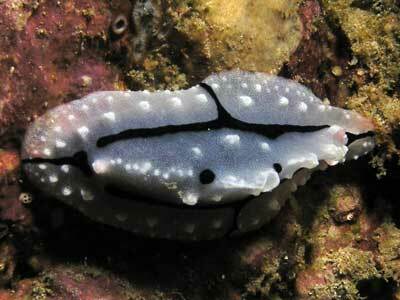 Spend the rest of the dive on the shallower sections of the reef, although. 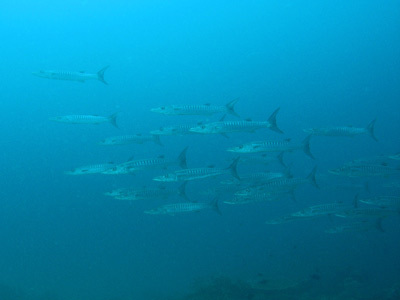 During this dive we saw a number of schools of barracuda (or the same school a number of times) as well as red bass. This is a great dive site, so close to the resort, yet with so much to see. Visibility was 20 to 25 metres and temperature 19ºC.